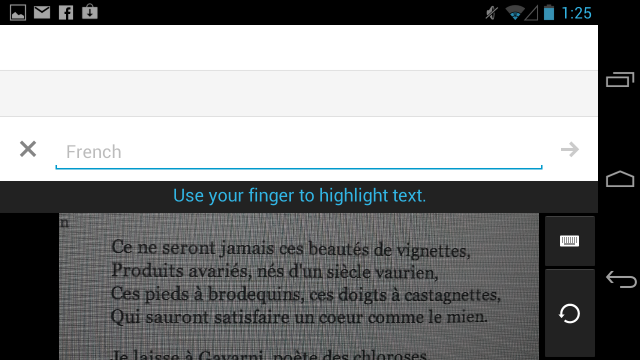 The latest edition of the Google Translate app can now interpret text from photos, reported Android Central. The image feature processes all languages available in Translate, and permits users to highlight the text they would like to convert to a different language. The added functionality is identical to an iOS app released in December 2010 called Word Lens, which can interpret text picked up by the iPhone’s camera. Word Lens could show the interpreted text right in the viewfinder itself, but is nevertheless bounded to only three language packs for translating to and from English (Spanish, Italian, and French), each of which cost $4.99. The new Google Translate is available as an update or download and is now in the Google Play store for Android phones running 2.3 Gingerbread or later.